method to make curd or dahi at home from milk. 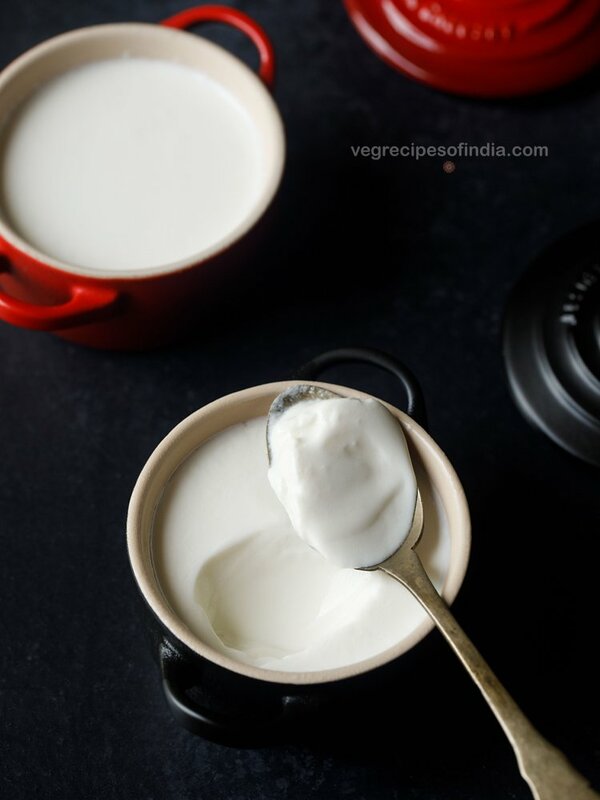 how to make curd or dahi or yogurt at home with tips and step by step photos. 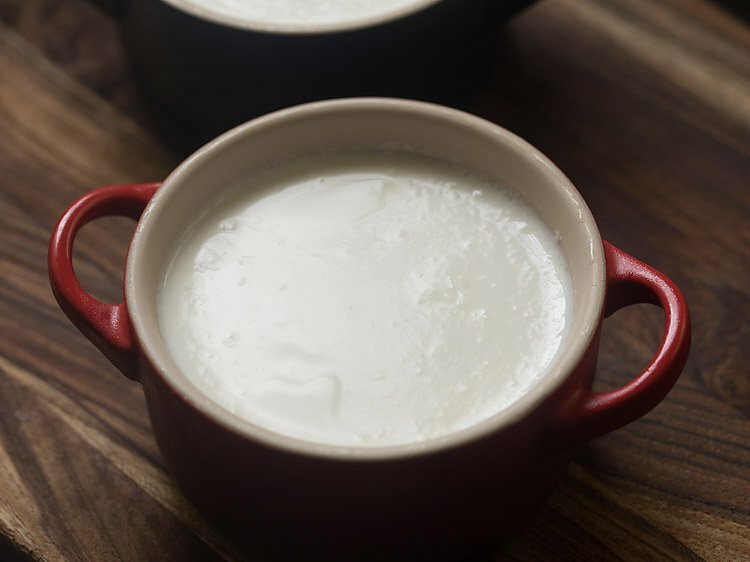 a couple of requests on how to make curd/dahi at home and how to make paneer…. 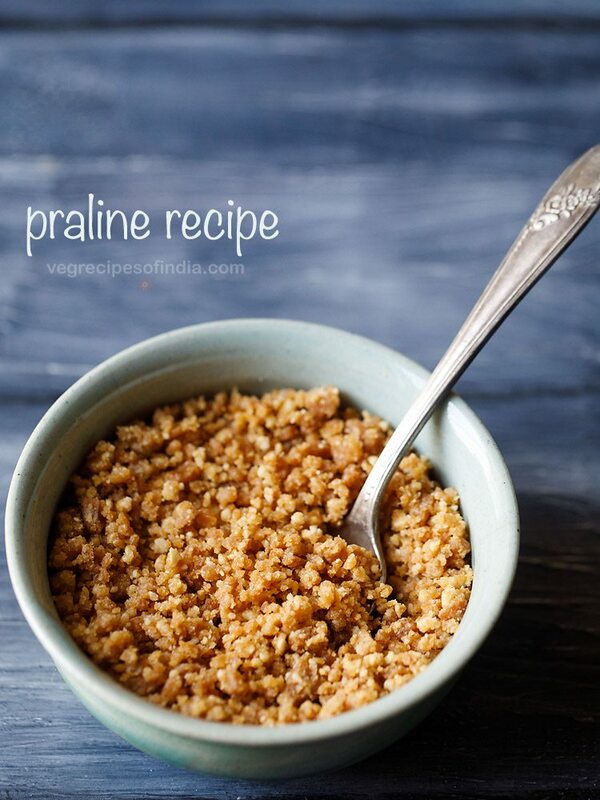 and thus this post on making curd at home. 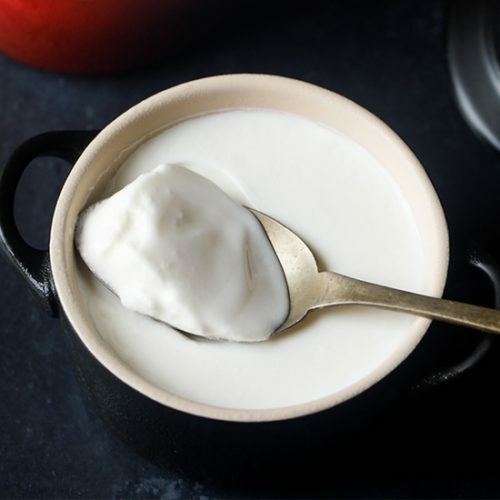 summers are the best time to have curd (yogurt) just plain or sweetened or in biryani, kadhi, lassi, shrikhand, paneer tikka, aloo tikka or a simple raita. yogurt based dishes are cooling and ideal for summers. i won’t be going into the food science of making curd and the fermentation process. 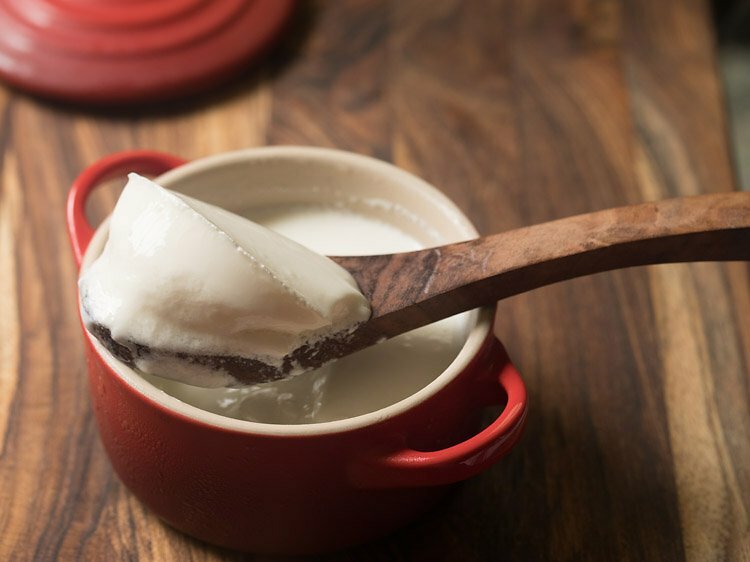 will just keep it simple with a few tips to keep in mind whilst making curd at home. use a good quality milk. 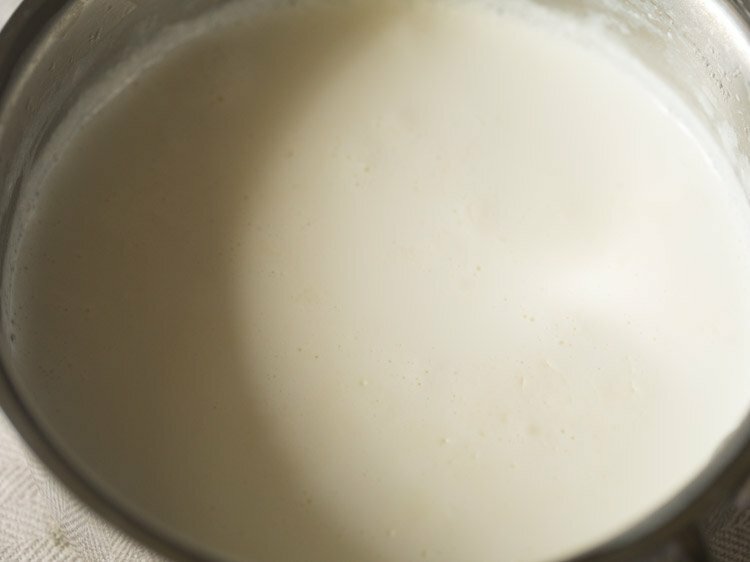 full cream milk yields a luscious and thick curd. 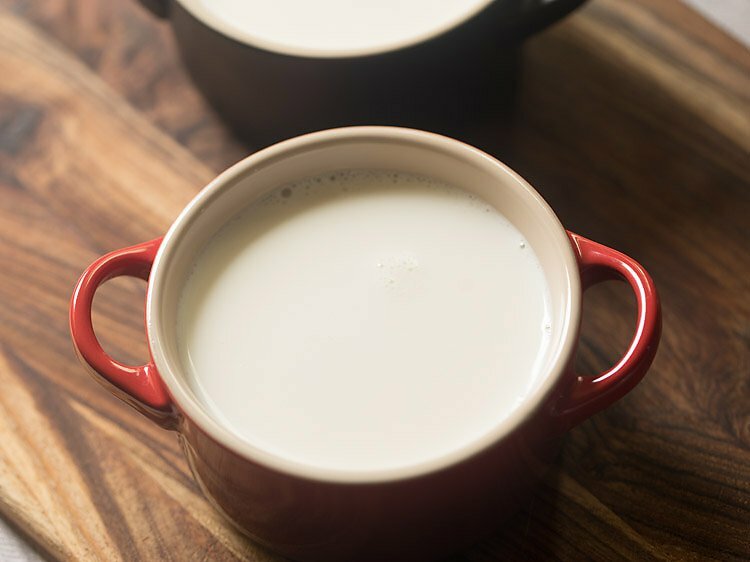 always boil the milk before making the curd. this ensures that the milk does not spoil during the fermentation process. the milk should not be hot. if its very hot the milk may coagulate and you might end up getting a grainy curd. if its little hot then the curd does not become thick and is a bit runny with some whey in the curd. if the milk is cold, then the curd won’t be set at all. the milk must be warm. just dip your little finger in the milk and you should feel warm not hot. it is very important to dissolve the curd culture uniformly in the milk. whisk very well with a spoon or a whisker. 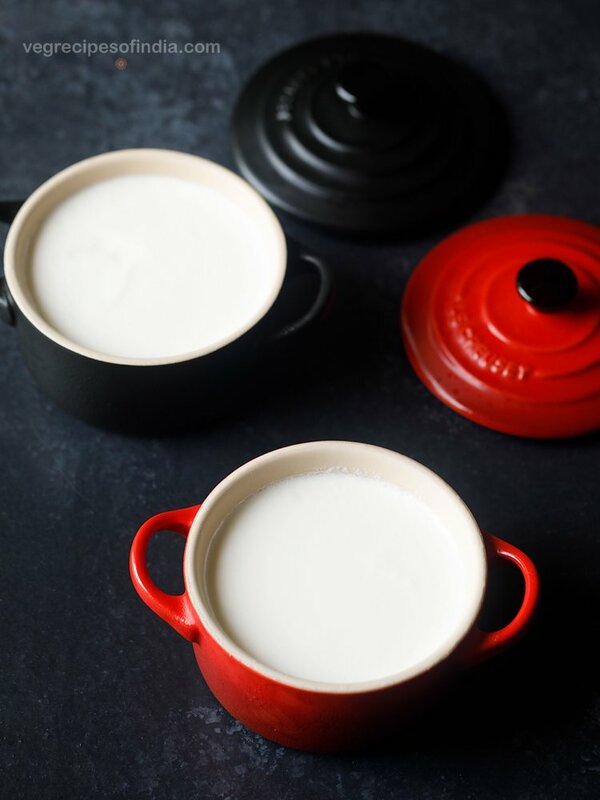 if you stay in a cold place or have cold temperatures, then cover the bowl or pan in which the curd mixture is with a warm towel or warm blanket and keep it in a warm place in your kitchen. also you could place the bowl in a big large jar of wheat flour and then cover the jar. this is how my mom-in-law would make curd in the delhi winters. in summers the curd will set faster than in the winters. so remember this point. you could use any quantity of milk you want to make the thick curd. 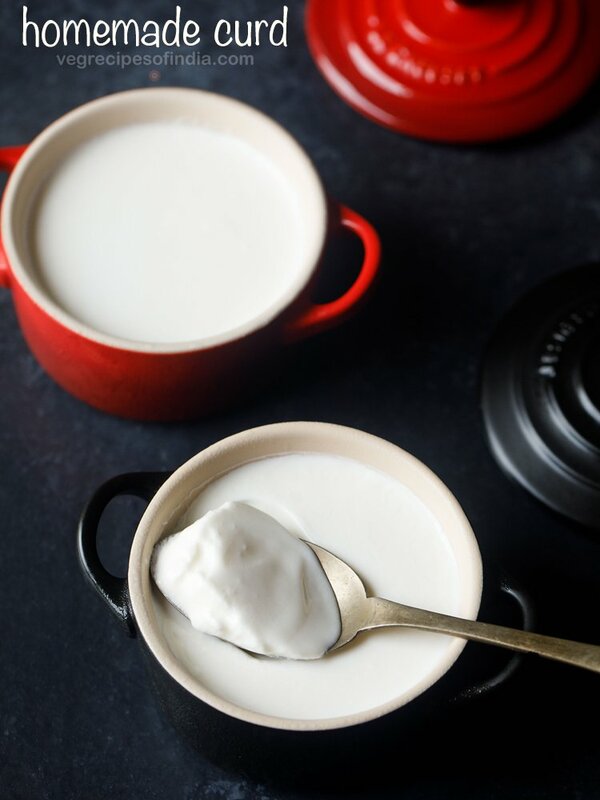 for half a litre milk, 1 to 2 teaspoons of curd culture works fine. increase proportionally for larger quantities of milk. once the curd is set, refrigerate the curd. you can also serve it plain with aloo paratha, plain paratha or other stuffed paratha varieties. 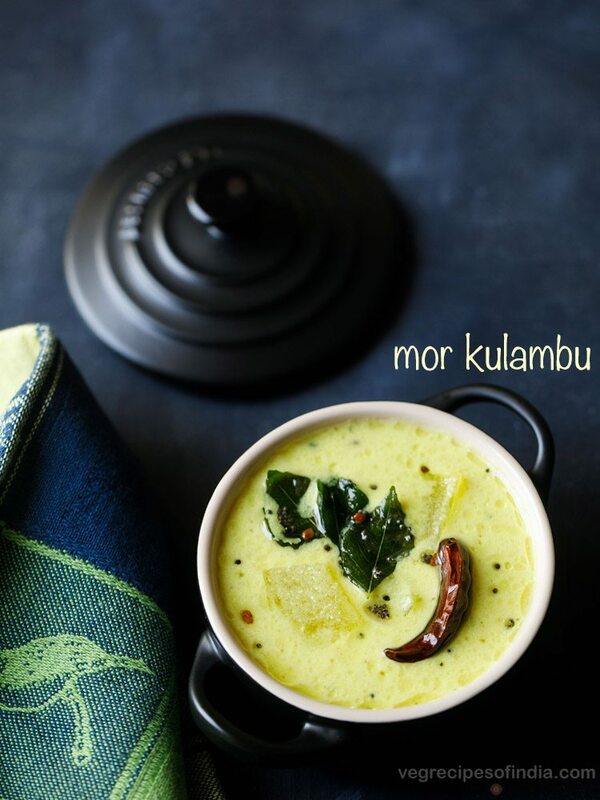 in the same pan that you have boiled the milk, add 1 tsp of curd and mix well. cover and keep the pan for 5-6 hours or till the curd has set. 1:.first step is to take a thick bottomed pan and rinse it water. 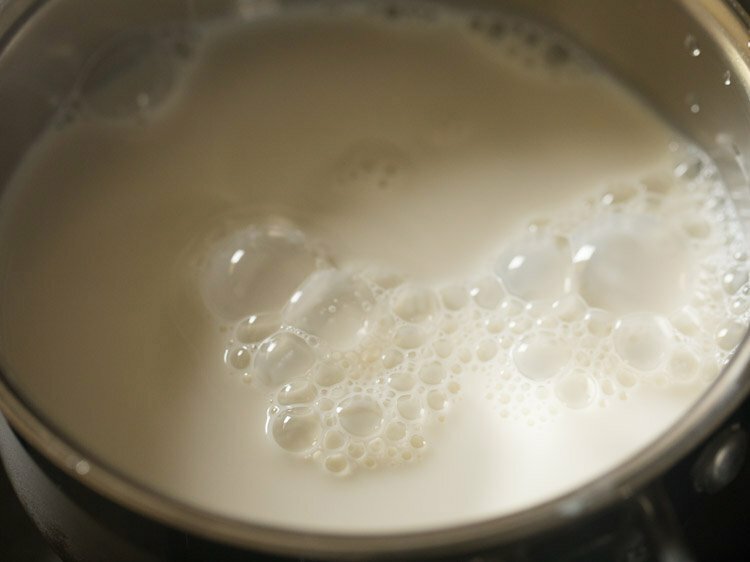 2. then add ½ litre of milk – about 2 cups milk. 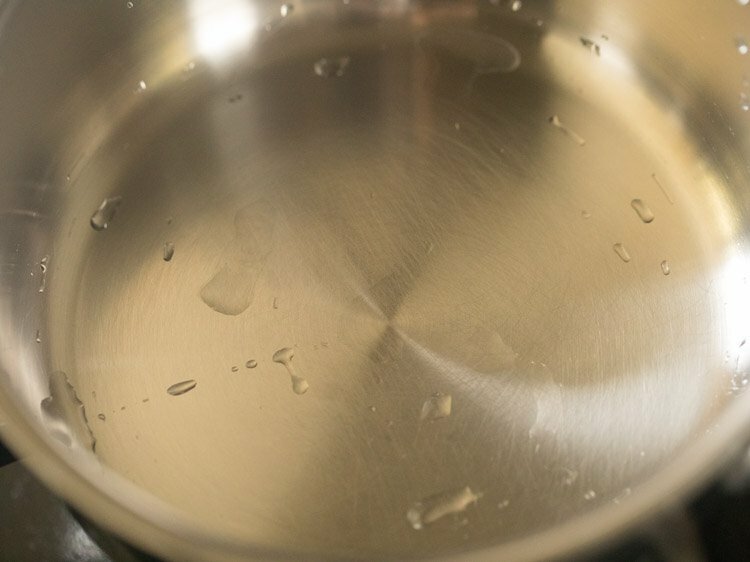 keep the pan on the stove top and begin to heat milk on a low to medium-low flame. 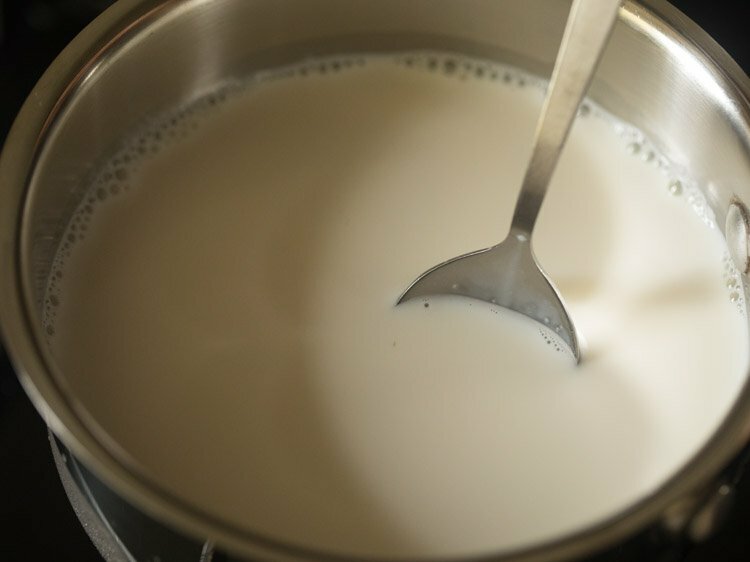 3. when the milk is getting heated, stir once or twice, so that the milk does not get browned from the bottom. 4. let the milk come to a boil. 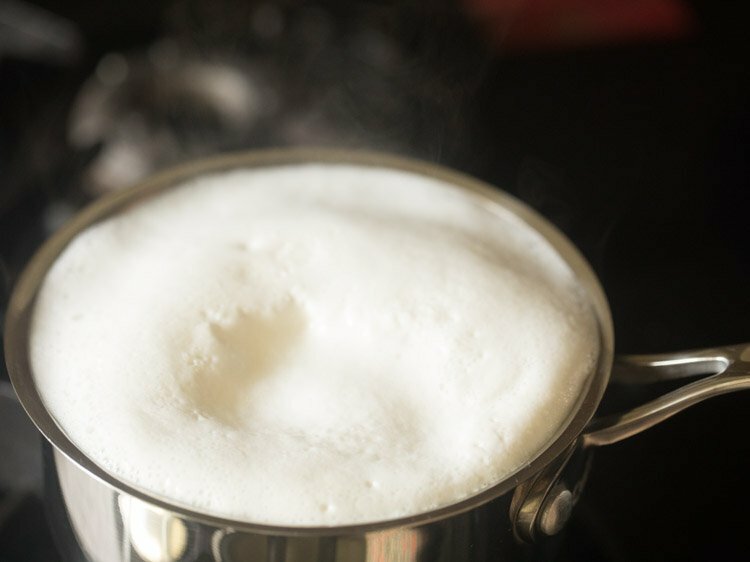 milk will froth and bubble when it comes to boil. 5. you can even heat milk to a temperature between 85 to 96 degrees celsius. 6. switch off the flame. 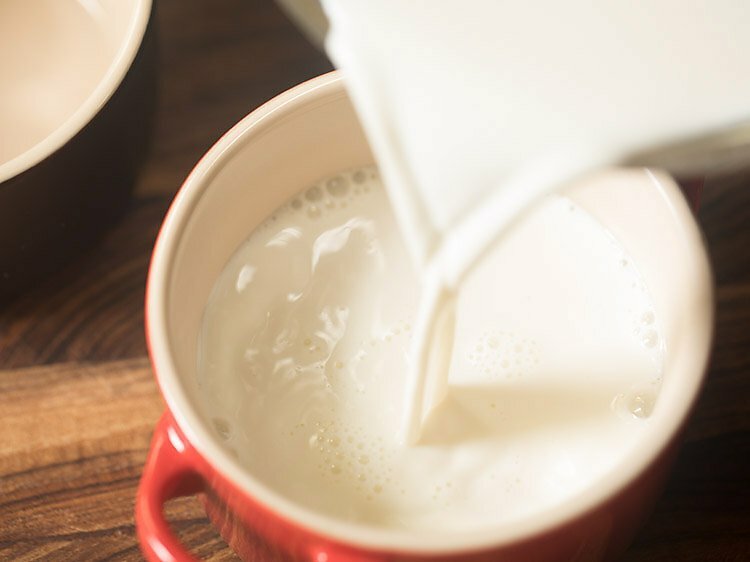 remove the pan and keep it aside on the kitchen counter for the milk to cool at room temperature. we just need to the temperature of milk to reduce till the milk becomes warm. 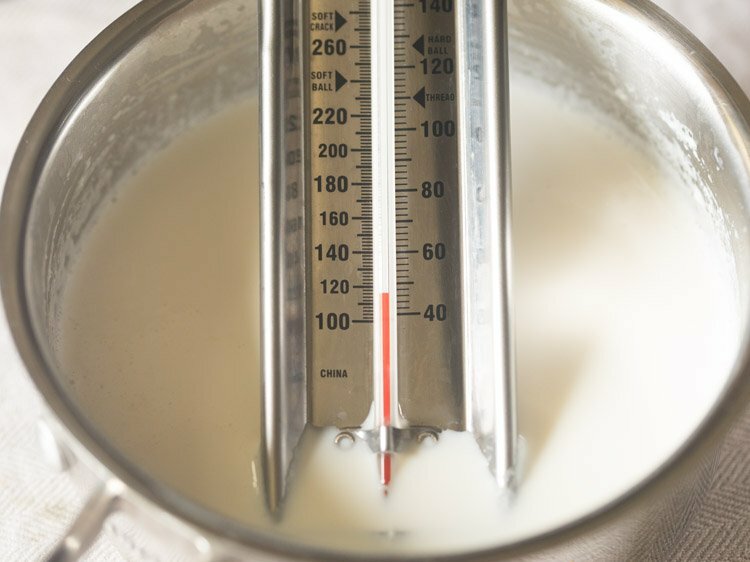 7. you can check if the milk has become warm with your fingers (touch method) or with a thermometer. 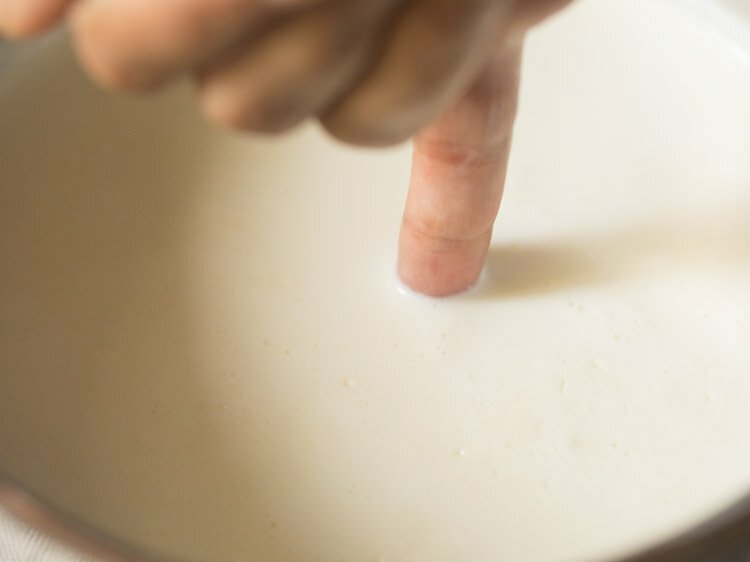 dip your little finger in the milk and you should feel warm and not hot. another way is to touch the pan. 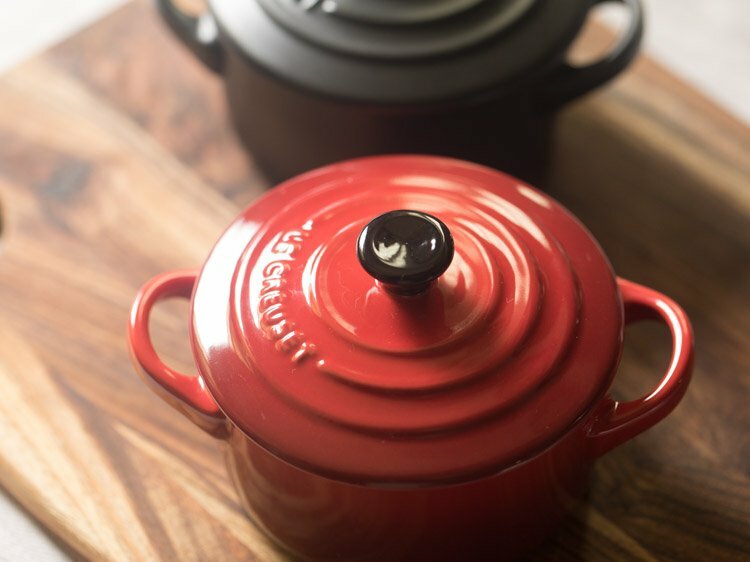 when you touch the pan, it should feel warm and not hot. 8. you can even use a food thermometer to check the temperature. 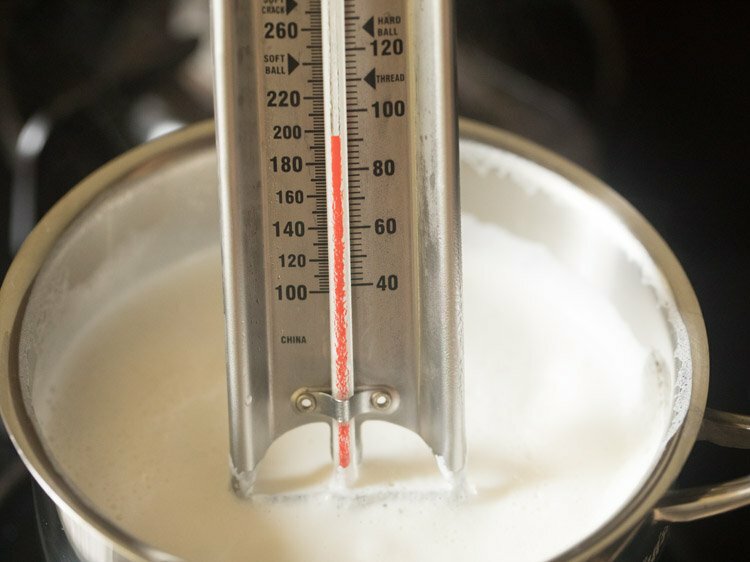 the temperature of the warm milk should be between 39 to 44 degrees celsius. 9. now take 1 to 2 teaspoons of the curd starter and add in the warm milk. in winters you can add 2 teaspoons. whereas in summers 1 teaspoon works fine. 10. with a small wired whisk or a spoon mix very well. 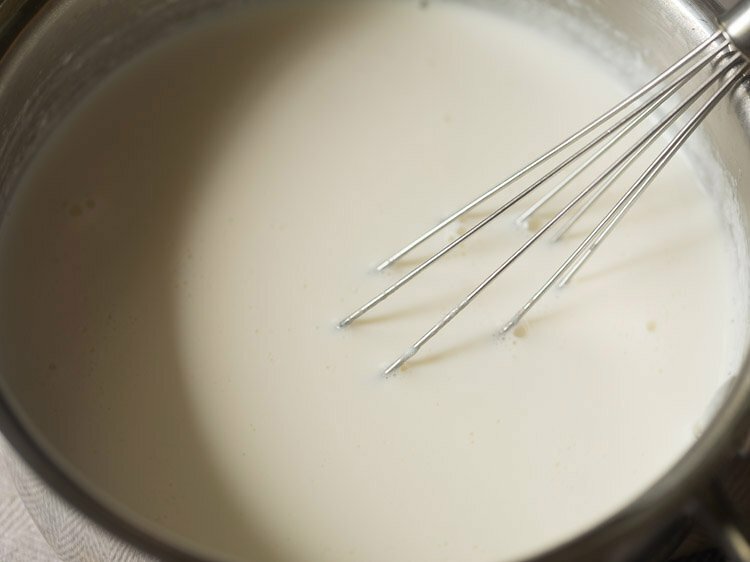 a small wired whisk makes the job of mixing the curd starter very well in the milk. 11. then pour this mixture in a bowl or a pan. 13. cover the pan or bowl with a lid. then keep at room temperature for 4 to 5 hours or till the curd is set. you can also keep overnight also. i kept overnight. the time taken for the milk to get converted to curd largely depends on the temperature. 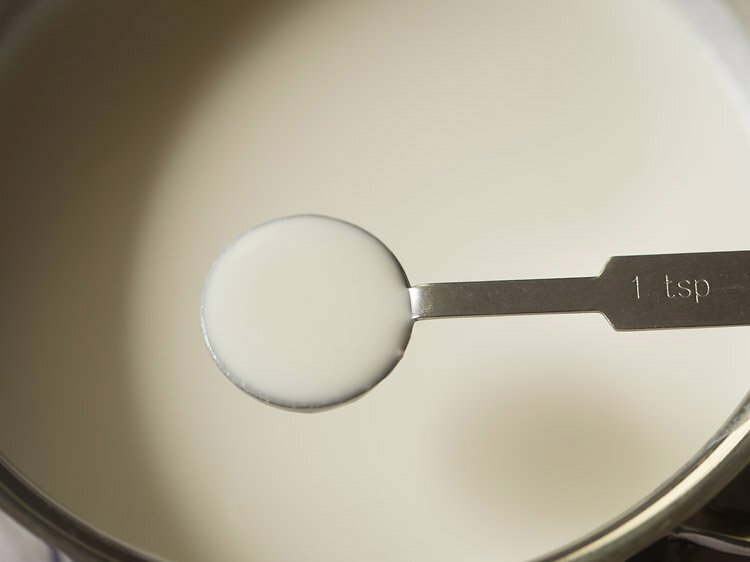 in a warm, hot and humid climate, the time taken for the curd to set will be 4 to 7 hours. whereas in a cool or cold climate, the time taken can be 8 to 12 hours. 14. next day you will have a nice well set homemade curd. 15. you can see in the picture its a properly set thick and creamy curd. 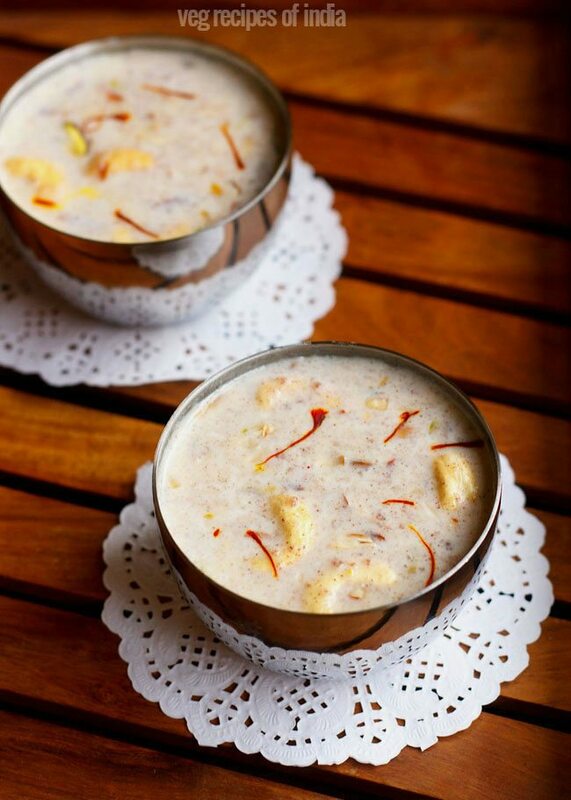 16. curd or dahi can be had plain or sweetened or can be made into a dessert, drink or any dish of your choice. Do you use non homogenized milk? My curd sets but there is so much whey in it. Your curd photo looks so thick and creamy without any whey. How to minimize whey in curd? shubha, i use homogenised milk and do not have any problem with getting whey in curd. firstly in summers, do not keep the curd for a long hours as then the whey separates. secondly add less amount of the starter in summers. so for half a litre of milk, you can add 1 teaspoon of curd starter. too much of starter can also lead to the whey getting separated once the curd sets. do make sure that the milk is not hot. the milk has to be warm. 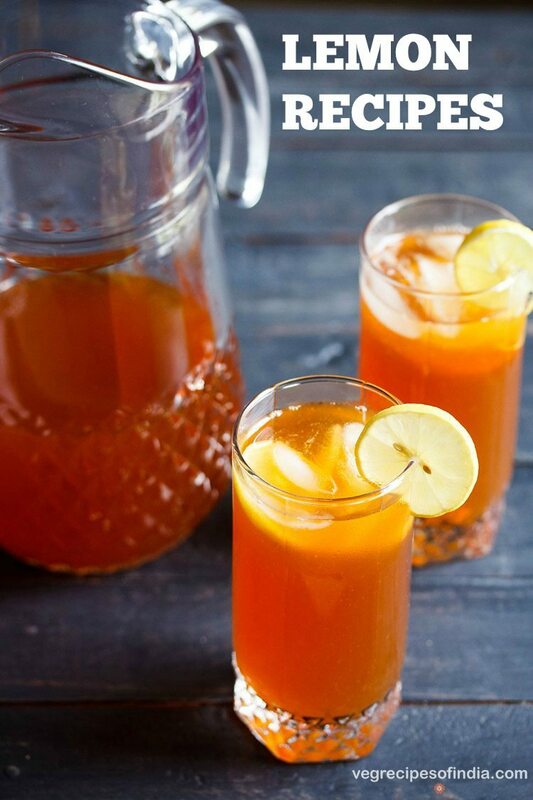 you can even use cold milk and add the starter and keep for setting in these hot summers. the curd sets very well and is thick. no need to heat milk. if the milk is pasteurized or has been boiled earlier and refrigerated and then it can be used. hope this helps. Thanks so much for getting back. I keep my curd in the Instant Pot so it is independent of outside temperatures. I will monitor the heat of milk better when I add it to the bowl containing a teaspoon of the culture and see if that helps. The milk is pasteurized so maybe I can try to keep it cold.Thanks for your tips. This is Arusha again….I have tried nearly 10 to 15 times but my milk does not set at al to turn into Dahi….I boiled milk in micro, on electric stove top and in different vessels also, like for micro I used pyrex bowl and for stove top I used steel vessel..but never I succeeded….In india my dahi sets in few hours but here, in the US it never happens..I have used full fat, 2 percent, whole milk…but did not get good dahi.can u give temperature in degrees, so I can try… do u think vessles make any difference in setting dahi?? arusha, i will update in a two days the temperature settings on this post. i just made dahi yesterday. i use steel pan for heating. i even use clay pot at times for heating milk. keep the bowl or pan in a warm place. also the outside temperature has to be warm or hot. 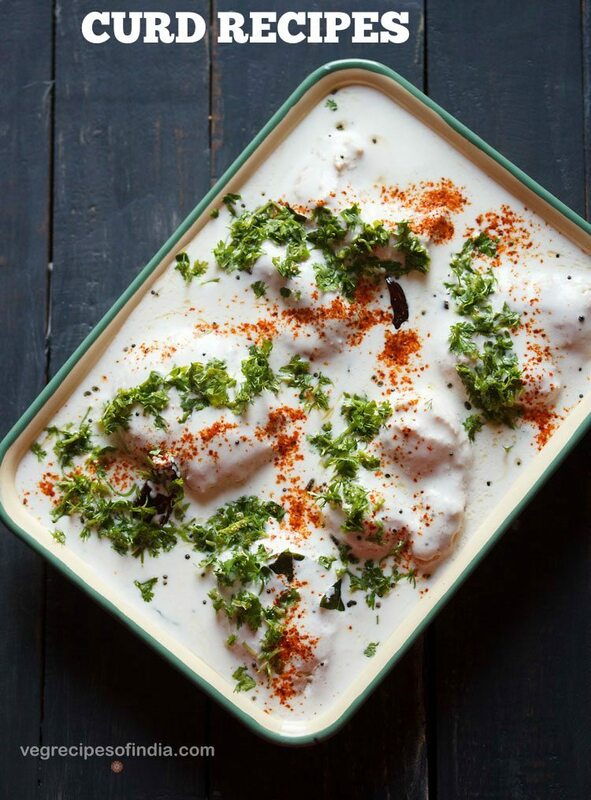 in cold seasons setting dahi can be tricky. usually i cover the pan with a warm napkin or a towel and keep it in a warm corner of the kitchen. do not keep in a place where there is cold draft of air coming through. my mother in law keeps the pan in a large container (dabba) of atta. atta is warm and it helps in setting dahi easily. what is sold in the west as yogurt is different than what we make in india as curd. curd has a pleasant sour taste and is not very thick. of course one has to taste curd made with the right strain of bacteria. what is sold even in indian markets as curd has a different taste as compared to the ones made in homes. without a culture also you can make curd, but you need to have a nice warm climate. what i do is, i heat milk till its slightly hot. just a bit above being warm. then remove the crowns of green chilies, about 10 to 12 crowns. place the crowns on the milk. cover and keep. this method needs a warm room temperature and won’t work in a cool or cold climate. it takes 7 to 9 hours for the curd to set. you can also use dry red chili crowns. 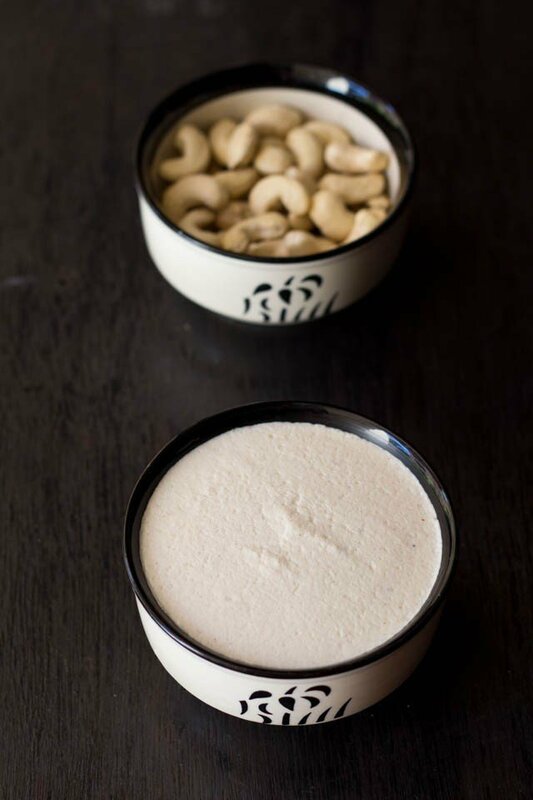 once the curd is set, then keep a few teaspoons of it in the fridge or freezer and then use this culture to make the second batch of curd with the method mentioned in this recipe post. for paneer, once the milk comes to a boil, add 3 to 4 tablespoons of curd. stir well and the milk will split. you may need to add more if the milk does not split. Hi Dassana,I have been making curd for quite some time now, but I follow a slightly different process. The glass bowl in which I intend to set the dahi, i smear the curd culture in that nicely like a coating, and then I pour the warm milk in it, and let it dry overnight in a corner of my kitchen. The curd comes out fine. I have never done it your way, but would try it and let you kNow. By the way, why is it that after repetitively using the curd culture from the same store bought curd cup, on the 4th or 5th time , the curd eventually doesn’t set as well as the 1st time?? Also have you ever prepared Greek yogurt?? chayanika, thanks a lot for sharing this suggestion. i have always stirred the curd culture in the milk. i liked your method. i also sometimes just add green chili or red chili crowns in warm milk and let the curd set. this i do, when i do not have curd culture. i have never faced this issue. in fact as time progresses, the curd sets very well. thats whats i have seen with the store brought curd.